There is a world of baby-centered retail out there just waiting for you to swipe your credit card, but most of the things that catch your eye are designed to be impulse buys. An impulse buy plays on your emotions as an expecting or new parent and lures you into the “that’s so cute” zone. Before heading out for a day of shopping for baby, learn the top 4 things you should not buy for baby. 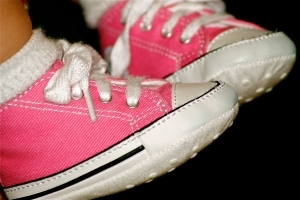 Shoes: Whether it is that new pair of Nike sneakers or a pair of baby slippers, babies cannot walk so they don’t need shoes. A pair of socks is perfectly fine for baby; providing warmth and protection. Trust me, you will spend more time getting those shoes on babies feet only to find out baby doesn’t like the restriction anyway. Diaper Genie: Maybe the brand name is different, but those diaper pails that come with special inserts you have to buy later on are nothing more than a waste of time and money. At first you may love the idea of folding babies stinky diapers into a tight ball and stuffing it into a plastic bag before twisting the top of the pail to seal off the stench, but that phase will pass – quickly. Keep your leftover grocery bags or invest in some cheap zip close bags for diaper changes on the go. Electric Bottle Warmer: Most electric bottle warmers take up to 10 minutes to warm one bottle – baby does not want to wait that long and you don’t want to hear baby crying when you could warm the bottle manually or use warm water to make the bottle. Electric Wipe Warmer: Wipes may be cold, but wipe warmers are not the best use of your baby budget. The heating element can dry out wipes leading to buying more wipes than you need. You’ll soon find, when you change baby on the go, that room temperature wipes are just fine. Buy tons of things for baby, but before buying the next novelty item make sure you think twice – three times – about what you’re buying. Do you really need that baby item or are you caught in the “that’s so cute” stage?